The Jazzy 1133 delivers the benefit of easy transport, disassembling into five manageable base pieces. 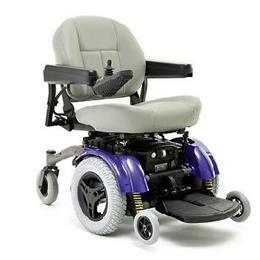 Plus, the 1133 offers sporty, unique styling and high performance with standard Active-Trac Suspension -- a true innovation in the world of full size, transportable power chairs. Quite simply put, the Jazzy 1133 is the perfect take-along power chair choice for active folks on the go! Available colors: Black Onyx, Candy Apple Red, Viper Blue. Standard Seating: Contoured Seating, Maximum Dimensions: 20" x 20"